The ruling Bharatiya Janata Party (BJP) and the Opposition alliance led by the Congress are now engaged in a desperate exercise to woo each other's MLAs after Governor S.C. Jamir asked Chief Minister Manohar Parrikar to seek a vote of confidence in the Assembly tomorrow. A seven-judge Constitution Bench of the Supreme Court today commenced hearing on a batch of over 100 petitions seeking correct interpretations of two of its earlier judgements regarding admissions in medical and engineering colleges in a bid to make these easier for students. The Supreme Court has declined to intervene in the Punjab and Haryana High Court order quashing a notification of the Punjab Government bringing the victims of terrorism and riot incidents on a par for the benefit of 1 per cent reservation in medical and professional colleges. High-profile Congress Lok Sabha member, industrialist and a page three fixture, Naveen Jindal, today found himself under fire from the party leadership. Mr P K Hormese Tharakan, former DG of Kerala Police, today took over as the new chief of Research and Analysis Wing (RAW) succeeding Mr C.D. Sahay, who retired yesterday. The new RAW Chief, who is designated as Secretary (R) in the Cabinet Secretariat, has served in RAW for over two decades. Long-distance tariffs in the country will come down from today as cellular operators have announced reduction in call rates to pass on the benefit of cut in access deficit charge (ADC). Lucknow girl boasts of a unique collection of match-box covers. Ending several days of uncertainty, Governor Jamir decided to disregard appeals made by the Congress to dismiss the Manohar Parrikar government and invite itself to take over. Sources said, Congress President Sonia Gandhi was opposed to the idea of dismissing an elected government and went with the view that constitutional propriety must be followed. Angry Congressmen are now accusing Ms Gandhi of stabbing the state unit in the back. “We were given the impression that the Governor would dismiss the BJP government after it was reduced to a minority,” a senior party leader who played a major role in getting four BJP MLAs to resign said. He further added that Ms Gandhi would have to take the blame if Mr Parrikar won the trust vote tomorrow. Mr Parrikar was all praise for the Governor. "He has upheld democracy after turning Raj Bhavan into a Congress party office for three days," Mr Parrikar told reporters. "There is nothing called majority or minority. Having the confidence of the House is what matters and I will prove that I have the full confidence of the House tomorrow," Mr Parrikar said. Both groups have 18 MLAs each after four MLAs from the BJP resigned from the House last week in an attempt to topple the government. However, the Congress-led alliance claims a slight edge since the Speaker, who is from the BJP, is not permitted to cast his vote unless there is a tie. Still both groups are not taking any chances and are trying to get MLAs from the other side to resign. the sources say, MLAs are being lured with as much as Rs 15 crores to resign. They are also being promised tickets to contest afresh from their old constituencies in addition to ministerial berths if they are elected. A Bench, headed by Chief Justice R.C. Lahoti, before proceeding with the arguments, sought to know from the counsel of various parties the details about total number of available medical and engineering seats prior to 11-judge Constitution Bench judgement of October 2002 in the T.M.A. Pai case, after it and post-August 2003 judgement in the Islamic academy case by a five-judge Bench. This was necessary to assess the total availability of seats throughout the country, the Bench said, while making it clear that it would only consider those aspects regarding admissions on which various states and private institutions had tried to raise certain “confusions” by giving different interpretations of the T.M.A. Pai judgement by the five-judge Bench. Over 100 private unaided medical and engineering colleges had approached the apex court, seeking various clarifications, including the minority quota, management quota, NRI quota, common entrance test and separate tests by an association of private colleges. Since there was a spurt of litigations with regard to admission matters since the two judgements, the apex court had decided that the issue needed to be urgently addressed by a seven-judge Bench to streamline the admission and save the students from various difficulties. A Bench of Mr Justice Y.K. Sabharwal and Mr Justice P.P. Naolekar rejected the special leave petition of the Punjab Government while hearing the petitions of four students from riot-affected families, whose admission was also cancelled in view of the High Court striking down the state government order. The court was not agreeable to the contention of the Punjab Government’s standing counsel Bimal Roy Jad that the High Court order needed to be reviewed. Prior to the August 2004 notification of the Punjab Government bringing terrorism and riot victims on a par for reservation benefit, the terrorist victims had the first preference followed by the candidates from the riot -affected families. The court also rejected the petitions of four students, Ghatdeep K. Lamba, Varundeep Singh, Balwinder Singh Tiwana and Amrit Lal Dhillon, belonging to riot-affected families, challenging the cancellation of their admission after it was informed that they were short of attendance. The four students were accommodated in medical colleges in the state against handicapped quota seats, which had remained unfilled after the government’s notification. But with the quashing of it by the High Court, their admission was automatically cancelled. The High Court, in its order passed in September last year, had said that the prefrencewise priority to terrorism and riot victims could not be diluted. The apex court was agreeable to allow the four students to continue with their studies on compassionate grounds only on the condition if they could meet the minimum required attendance during the current academic session. It refused to carry forward their admissions to next year saying it was bound to affect the new admissions. The court reminded the students that their admission was possible only because of the amendment made in the rules by the government, otherwise they would have not even got into the medical colleges. Since the notification of the state had been struck down by the High Court, it was not possible to accommodate them in next academic session, it said. Mr Jindal apparently defied all party plans when he virtually “abducted” film-star MP Govinda in his helicopter from Sonepat and flew him to Hisar to campaign for his father, Mr O.P. Jindal. According to the plans drawn up by the AICC, Govinda was to address three meetings in Sonepat, Panipat and Karnal today. 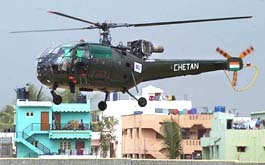 Having made a late start, the film star just about managed to put in a brief appearance at Sonepat but before he could proceed for his other two scheduled meetings, he was whisked away in Mr Naveen Jindal’s helicopter for a spot of last-minute electioneering for his father. Consequently, the AICC was flooded with complaints from Congress workers in Panipat and Karnal who had publicised Govinda’s visit and made all the necessary preparation for his meetings. Not only were their efforts wasted but they also had to face the wrath of the people who were waiting to see the film star. The Congress leadership was furious with Mr Jindal for upsetting party plans with one angry senior leader even dubbing it as “anti-party activity”. The Congress election coordination committee, which was informed about this incident at its meeting today, also took serious note of this “act of defiance”. This is not the first time that Mr Naveen Jindal has fallen foul of the AICC leadership. Congress insiders still recall how he put them in an embarrassing position when the young industrialist went out of his way to praise former Prime Minister Atal Bihari Vajpayee the day he joined the Congress. Mr Tharakan served the Kerala Police after his induction in IPS till 1976 when he was shortlisted for central deputation and joined the Cabinet Secretariat in September 1976. Mr Tharakan takes over at a time when the government is engaged in the major task of overhauling the external intelligence agency, including strengthening its counter-intelligence system. While Airtel and Hutch have said international long distance calls will be cheaper by Rs 1.75 a minute and domestic calls will cost less by 35 paise a minute to all destinations, Reliance Infocomm and Idea Cellular are yet to announce reduction in tariffs, an Idea Cellular spokesman said the company was working out reduced tariff structure, which would be announced by Friday. Meanwhile, Reliance Infocomm today slashed by 33 per cent to 73 paise a minute rates for its pre-paid fixed wireless phones (FWP) in the four metros. However, a spokesperson said Reliance Infocomm was already offering one of the lowest tariffs and so the company was not planning to reduce rates further.